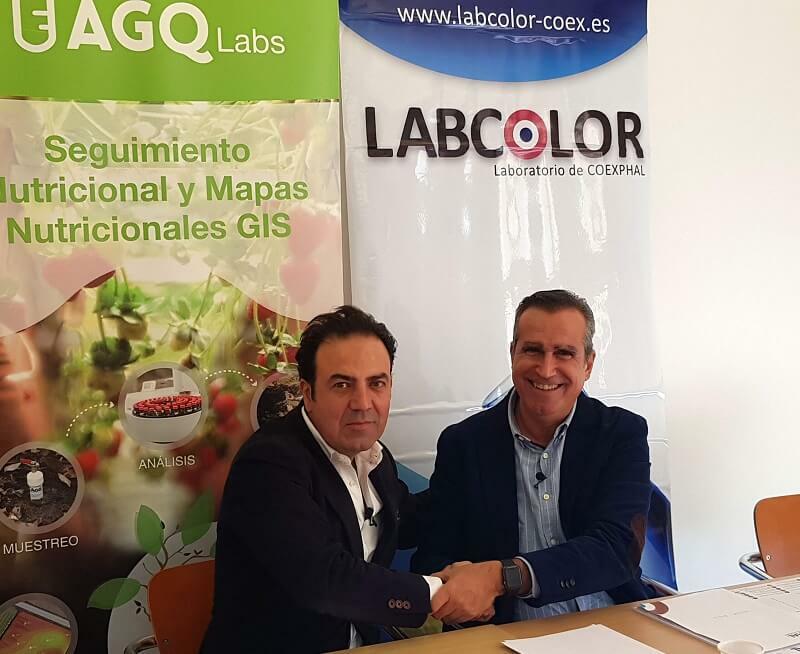 Labcolor (COEXPHAL laboratory) and AGQ Labs have reached a collaboration agreement that will expand and complement the services that both currently offer. The alliance between Labcolor and AGQ Labs will improve the competitiveness of both centers, acting as a large group that offers a wider range of services and will give tailored advice to clients from all over the world. The agreement was carried out by the manager of the Association of Organizations of Producers of Fruits and Vegetables of Almería, Coexphal, Luis Miguel Fernández, and the president of the technology group AGQ Labs, Estanislao Martínez. On the other hand, Luis Miguel Fernández has valued very positively “the power to have a technological platform such as AGQ Labs, with a presence in more than 20 countries, and laboratories in points as interesting for our partners as the United States. On the other hand, thanks to the wide range of environmental, agronomic and food quality analysis with AGQ Labs, the service that we will be able to transfer to our producers and associated trading companies will be much more complete”. AGQ Labs will provide Labcolor with the work in different areas that are relevant to the fruit and vegetable sector, such as Agronomy services, where it has more than 25 years of experience, Monitoring and Nutritional Control of crops to know and evaluate the nutritional needs of the plant and adapt the contributions of water and nutrients according to the real demand, where AGQ Labs currently manages 2 million hectares worldwide. Another strong point of AGQ Labs are the environmental controls. For its part, Labcolor will make available to AGQ Labs its experience in specific areas where it has achieved major and important achievements such as Phytopathology, a service that currently does not have the Sevillian laboratory integrated. The Department of Phytopathology of Labcolor has a great experience in diagnosis and identification of phytopathogenic organisms to avoid damages that diseases and plagues can cause in horticultural crops and their products, in seeds, seedbeds, crops in production, postharvest products, water of irrigation, soil, etc. AGQ Labs is a technological center that develops its activity in the agri-food, environmental and mining sectors. It has laboratories in Spain, Morocco, Chile, Peru, Colombia, Costa Rica, Mexico and the United States, as well as subsidiaries with logistics centers and technical offices in Argentina, Ecuador, Guatemala, Honduras, El Salvador, Nicaragua, Dominican Republic, Egypt, Tunisia, South Africa, Portugal and Italy. Its network of laboratories analyzed more than 500,000 samples last year, highlighting pesticide residue analysis, agronomic analysis (soils, soil solutions and foliar), and environmental analyzes (water, contaminated soil, waste, etc.). AGQ Labs has combined in its business model the technology of its laboratories with the specialization and knowledge of its professionals in the different business areas, thus providing highly valued specialized advice. Altogether, there are more than 700 professionals that make up the AGQ Labs staff. COEXPHAL, founded in 1977, brings together 97 producers, marketers of fruit and vegetables and the ornamental sector. In the last campaign its associates sold 2,194,268 tons belonging to 9,500 farmers whose production is cultivated in 31,800 hectares, which employ 60,000 people from more than 150 different nationalities. Labcolor, the laboratory of COEXPHAL, was created in 1988 as an instrument of the export sector aimed at improving marketing in the markets. In response to the demands of the sector, Labcolor has been incorporating different areas of work in order to cover the analytical and advisory needs. At present, it has the Departments of Residues and Pollutants, Plant Pathology, Production, Agronomy and Quality.